New Version WTrans available: Both, German and English language supported by the application and also by manuals. Contribution to Technoprom 2014, Novosibirsk:	"Geodetic Infrastructures for GNSS-Positioning Services(GIPS)"
Poster-Presentation: Prof. Dr.-Ing. Reiner Jäger: "Geodetic Infrastructures for GNSS Positioning Services (GIPS) - General Concept and GIPS-Development for the State of Brazil"
17. Internationale geodätische Woche Obergurgl 2013, 17.-23.02.2013, Obergurgl, Austria. Poster-Presentation: Dr. Ismail Kabashi, DI Josef Angst, DI Michaela Ragossnig-Angst, Prof. Dr.-Ing. Reiner Jäger, Dipl.-Ing. (FH) Simone Kälber, MSc. Eng. Bilbil Nurce: "Geodetic Infrastructures for the Albanian GNSS-Positioningservice ALBPOS"
Reiner Jäger, Simone Kälber, Lagutina Elena and Tatyana Gorokhova (2012): "Determination of transformation parameters between international and state coordinate systems on the territory of the Novosibirsk region" ("ОПРЕДЕЛЕНИЕ ПАРАМЕТРОВ ПЕРЕХОДА ОТ ОБЩЕЗЕМНОЙ К ГОСУДАРСТ ВЕННОЙ СИСТЕМЕ КООРДИН АТ НАТЕРРИТОРИЮ НОВОСИ БИРСКОЙ ОБЛАСТИ"). Paper presented by Tatyana Gorokhova at the Interexpo Geosiberia 2012, Novosibirsk, Russia, 17.04.2012 - 19.04.2012. Vasile Chiriac, Livia Nistor-Lopatenco, Andrei Iacovlev, Vasile Grama, Reiner Jäger, Peter Spohn, Ghadi Younis, Simone Kälber (2011): "Development of geodetic databases for MOLDPOS services". Presented by Vasile Chiriac at the United Nations International Meeting on the Applications of Global Navigation Satellite Systems, Vienna, Austria, 12 - 16 December 2011. 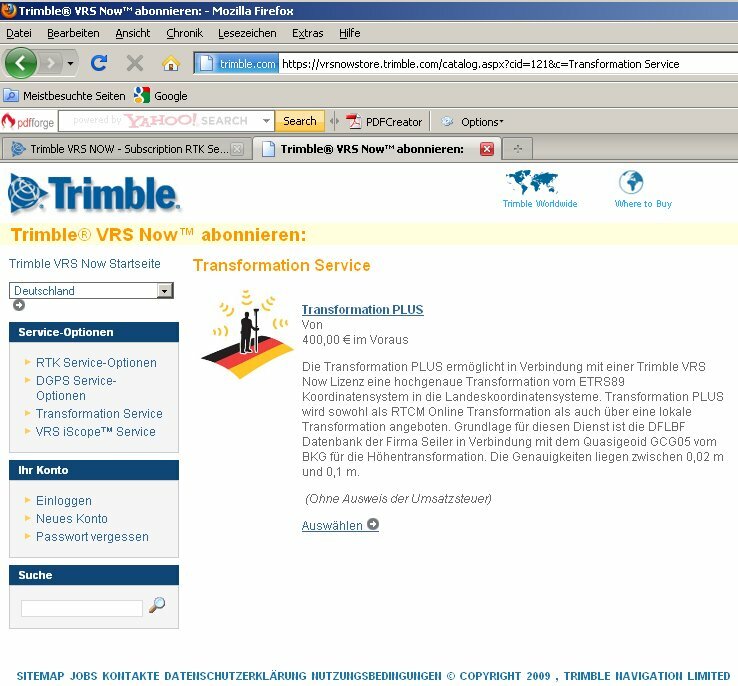 The SAPOS Baden-Württemberg transformation message is produced with GZTraS (Geozilla Transformation Server). Leica SmartNet runs with horizontal transformation based on the CoPaG-concept (DFLBF-databases). R. Jäger (2011): " Geodetic Infrastructures for GNSS-Positioning-Services (GIPS) - The Motor for Prospective and Economy Relevant Developments in Public, RaD and Industry Sector at Brazil". Presented at SBPC (Sociedade Brasileira para o Progresso da Ciência) Conference 2011 - German Scientific Delegation in Goiania, Brazil. GIPS Realisation for CROPOS using RTCM 3.1 Transformation Messages (1021, 1023) Tomislav BASIC: "CROPOS - Current Status and Implementatin of T7D Transformation Model". See also: Željko BACIC, Marinko BOSILJEVAC and Marijan MARJANOVIC (2011): "Usage and Upgrade ofthe CROatian POsitioning System - CROPOS". Paper presented to: FIG Working Week 2011 - Bridging the Gap Between the Culture; Marrakesh, Morocco, 18-22 May 2011. R. Jäger (2010): "Geodätische Infrastrukturen für GNSS-Dienste (GIPS)". XV Int. Symposium Geoinformation Monitoring of Environment 13 - 18 September 2010 Alushta, Krimae, Ukraine. New Version of WTrans available. Support of 1D fitting points - besides the already existing 2D and 3D fitting points - now implemented. Download WTrans (10 Points Demo-Version).